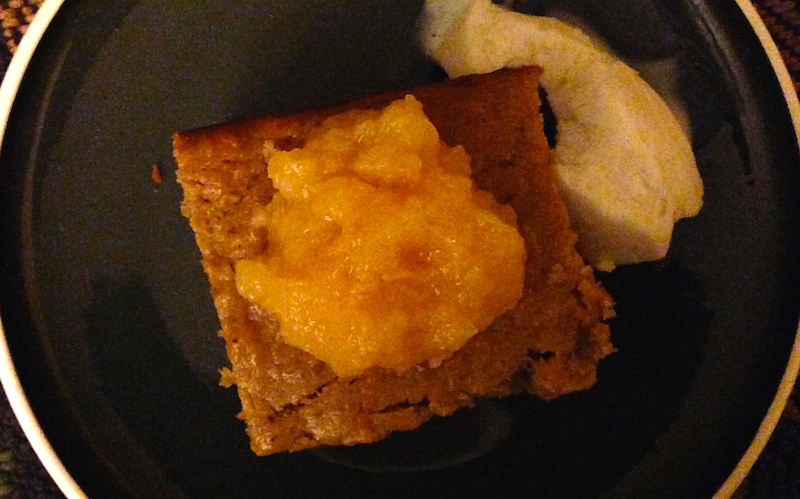 Good Stuff NW: When Life Gives You Quince, Make Cake! They're lumpy and hard as a rock, yellow as a golden delicious apple and with a floral fragrance that'll perfume your whole house. In fact, bowls of them were arrayed in homes in ancient Greece and Rome for just that purpose, and were given as gifts at Greek weddings in homage to Aphrodite, the goddess of love. I'd been obsessing over quince for a couple of weeks when my friend Myrna mentioned they had a bumper crop on their trees and asked if I'd like to pick some. You see, I'd made a batch of quince-infused vodka a couple of years ago based on her husband Karl's recipe. It turned out terrifically, the only problem being that first attempt had taken a year to fully mature and I hadn't documented the process well. 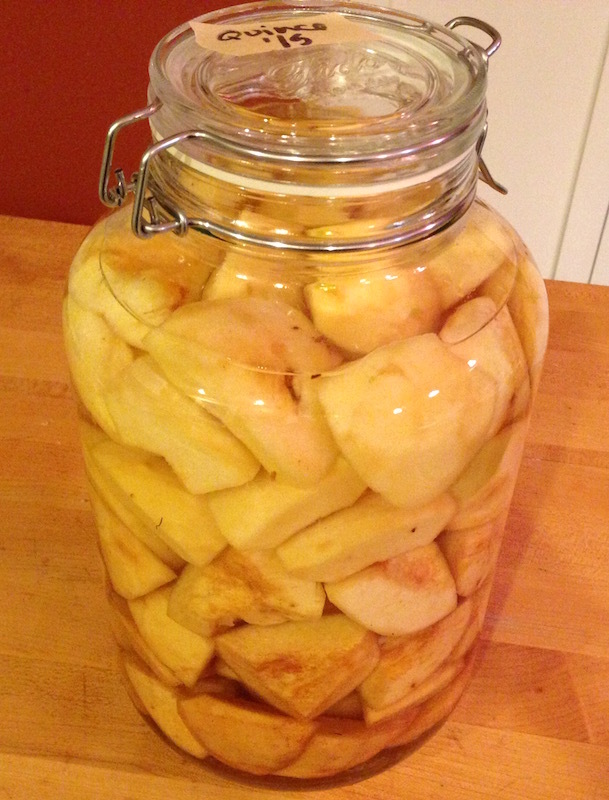 So after peeling and chopping up a few pounds and stuffing the pieces into a gallon jar with a couple of bottles of Monopolowa vodka—our preferred brand for infusing since it's good quality and cheap—it went immediately into the basement for a couple of months' rest. The problem was, there were still about four pounds of fruit left. I'd made quince sauce before, which is delicious, but in the spirit of exploration wanted to try something new. That's when I remembered my mother's recipe for applesauce cake, a moist little single-layer cake that she'd whip up when an after-school snack was called for. Since quince sauce is almost exactly the same texture, if a little denser, than applesauce, I figured it would make a good substitute. The quince sauce added a complexity of flavor and aroma that belied the simplicity of the cake, especially with a little scoop of ice cream served alongside. You can easily substitute applesauce back into the recipe, and I heartily recommend topping each piece of cake with a spoonful of whichever sauce you choose to make it with. To make the quince sauce, coarsely chop the quince into large pieces, removing core and any bruises or brown spots. Place in large pot over medium heat and pour in a cup of water and lemon juice. Stir to combine. When water in bottom of pot begins to boil, reduce heat to low simmer and, stirring occasionally to prevent sticking, cook until quince pieces are tender. Add sugar to taste (I like mine slightly tart, but it still takes a fair amount of sugar to get it to that stage). Allow to cool. If you want, you can mash it by hand or run it through a food mill to remove skins and make a smooth sauce. In a small mixing bowl, combine flour, baking powder, baking soda, salt, and spices. In a large mixing bowl or mixer, beat butter, brown sugar, and vanilla together until soft and fluffy. Add eggs one at a time, beating well after each addition. Add quince sauce and beat in thoroughly. Mix in dry ingredients a small amount at a time until just combined, but don't over mix. Add walnuts and stir them in by hand. Grease (using butter or margarine) and lightly flour an 8" or 9" square cake pan. Pour cake batter into pan and bake for 40 minutes. To test for doneness, insert a toothpick or sharp skewer into the center. It is done when the pick comes out clean. Serve with a spoonful of quince sauce on top and a scoop of ice cream alongside. We had quince grow in our orchard for the first time this year. I am making quince wine and soon will make membrillo. Love the smell of the quince and hope these recipes work out. Exciting! I'd love to know how your projects turn out…hope you blog about them! I love quince! That cake and vodka looks great. 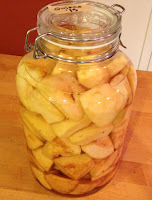 I made quince syrup and have been mixing it with bourbon and lemon for a weekend treat! That sounds like an amazing treat, Farmer Jo! I could also imagining it sweetening a cup of tea, as you would with honey. Thanks for the idea! A follower of my Twitter feed @goodstuffnw just posted: "In Korea they sell jars of quince and ginger 'drinking marmalade' which is used to make a hot tea." Great idea!